'Shofield Ford Covered Bridge' by Terry Auspitz - DPC Prints! The restored Shofield Ford Covered Bridge at Tyler State Park in Bucks County, Pennsylvania. 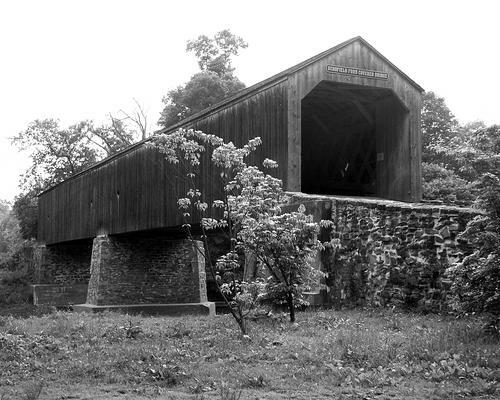 This is one of the many covered bridges in Bucks County and eastern Pennsylvania. Through September 30, 2005, This artist will donate 100% of his earnings from the sale of his prints to the National Multiple Sclerosis Society. Direct donations may also be made here. This photograph originally appeared in the Black & White Challenge.